More and more states are legalizing marijuana in some form. Moreover, a majority of the U.S. population is in favor of the drug for recreational use. 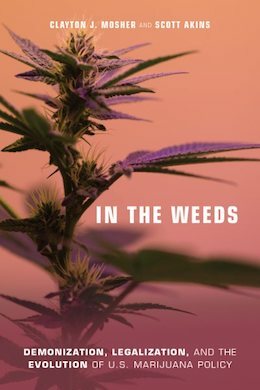 In the Weeds looks at how our society has become more permissive in the past 150 years—even though marijuana is still considered a Schedule I drug by the American government. Sociologists Clayton Mosher and Scott Akins take a deep dive into marijuana policy reform, looking at the incremental developments and the historical, legal, social, and political implications of these changes. They investigate the effects, medicinal applications, and possible harms of marijuana. Mosher and Akins end their timely and insightful book by tracing the distinct paths to the legalization of recreational marijuana in the United States and other countries as well as discussing what the future of marijuana law holds.